Love playing the game, and want to talk to other Puzzle Miners about it? General Discussion is the place for you! Before you start posting though, we recommend players check out our Forum Rules to stay up-to-date on what's A-OK and what's a big thumbs-down in our forum. We do our best to keep the forum nice and tidy, so here's a handy search bar in the top right corner of the sub-forum page. Enter in the most relevant keyword into the search bar, and click Go. Once you find an existing thread, feel free to add your comments and thoughts to it! Can't find an already existing thread? Well then it's time to get the ball rolling! You can look to the top left corner of the sub-forum page, in order to find the New Discussion button. 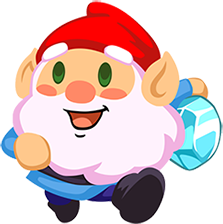 Thanks for playing Adventure Gnome, and being a part of our community! @therightwaye The basic gist is that it's a downward scrolling game where you click on tiles in order to have your adventurous gnome "dig" through them, in order to make a path to fall through. There's a set timer, and your goal is to try and dig as far down as you can while collecting as much treasure as you can at the same time.